Hitchcock's first appearance was in his third major UK film, The Lodger (1927) (earlier credited and completed films without cameos included The Pleasure Garden (1925) and The Mountain Eagle (1926, UK) (aka Fear o' God) - a lost film), and then in more of his major British films, followed by numerous appearances in his US productions. Two war-time shorts after 1940, Bon Voyage (1944) and Aventure Malgache (1944), did not contain cameos either. The most ingenious cameo appearances were in films with limited sets, as in Lifeboat (1944), Rope (1948), and Dial M for Murder (1954). Two recurring themes were that: (1) Hitchcock often carried a musical instrument, and (2) Hitchcock often used public transportation (buses, trains, etc. ), and was seen as a casual passer-by in the crowd in the public place (train stations, at an airport, etc.). Most of the cameos appeared early in the film, and often there was a bit of mild humor in the appearance (weight-reduction ads, getting up from a wheelchair, having an unbeatable bridge hand, drinking champagne to lessen the supply, etc.). 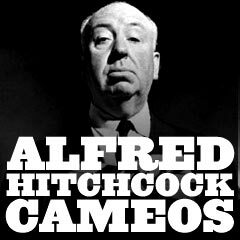 Note: Only once did he appear in an installment of his Alfred Hitchcock Presents (1955-1966) TV show - besides his personal introductions. The one appearance was in the 1958 episode of the third season titled A Dip in the Pool, in which he showed up on the cover of a magazine being read by Mr. Renshaw (Philip Bourneuf). See also this site's information on the Most Famous Film Director Cameos. Frenzy (1972) In the center of a crowd, wearing a black bowler hat, facing to the left. He is the only one not applauding the political speech-maker (delivering a speech about pollution and cleaning up the Thames River).